I still can’t believe that technology has progressed so fast for devices such as cell phones being capable of handling email in a jiffy – something I would have laughed at 10 years ago. 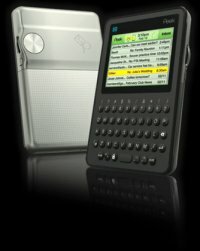 Peek is one of the later innovations, offering an e-mail only mobile device that was specially designed to let you manage your e-mail no matter where you are. Peek is a super thin and stylish device that lets you take your email with you and stay connected. With Peek service you get unlimited email for a flat, low monthly rate. Totally easy. Sound interesting? Peek will be available this fall in stores nationwide. This $99 device targets folk who don’t want to fork out hundreds more for a smartphone just because they want to access their e-mail on-the-go. It is available from Target and takes less than 5 minutes to set up, and best of all is, you don’t have to call a carrier and go through a web of human operators. It will cost you a flat monthly fee without having to worry about separate voice/data plans, hidden fees or surcharges. Compatible e-mail providers include Yahoo!, Hotmail, Gmail, AOL and majority of the other internet providers. I Wonder how reception is and speed.